SHERMAN OAKS, Calif. /California Newswire/ — Matic, a digital insurance agency whose technology enables borrowers to purchase homeowner’s insurance during the mortgage transaction, today announced a wide-ranging integration with RoundPoint Mortgage Servicing Corporation (RoundPoint), a mortgage loan originator and one of the nation’s largest non-bank mortgage servicing companies. The integration will make Matic’s one-click “get quote” button available to both customers and employees of RoundPoint. RoundPoint services over $75 billion worth of mortgage assets as a fully licensed subservicer for commercial banks, credit unions, mortgage companies and hedge funds. Now, homeowners whose mortgages are serviced by RoundPoint will be notified by Matic when they could save money by switching to a different A-rated homeowner’s insurance carrier. Homeowners will also be alerted if there’s an opportunity to get more coverage without an increase in premium. “Mortgage servicers rarely get to call their customers and offer a lower escrow payment or more comprehensive insurance coverage without a premium increase – yet these are exactly the kinds of opportunities Matic will bring to RoundPoint customers every day,” said Matic COO Benjamin Madick. 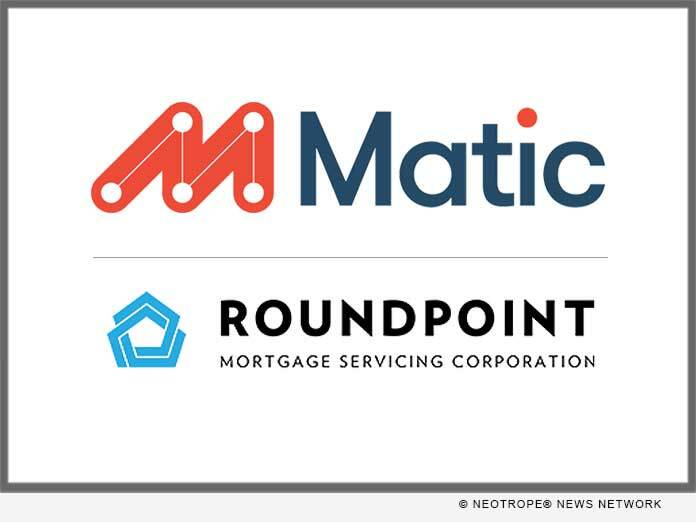 RoundPoint will also make Matic available to homebuyers applying for a mortgage loan through the company’s retail mortgage lending division. In addition, Matic will be available to RoundPoint employees via a private-labeled web portal. “The fact that RoundPoint is making Matic available not only to our mortgage origination and servicing customers, but also to our employees, is a testament to our enthusiasm for Matic’s innovative homeowner’s insurance experience,” said RoundPoint CEO Kevin Brungardt. Matic is a technology-driven insurance agency focused on helping lenders and loan officers better integrate homeowner’s insurance into the lending process. By using loan application information and first-of-its-kind technology, Matic provides homebuyers multiple policy options within seconds, helping loan officers close their loans faster. Matic delivers the most trusted, affordable insurance policies available thanks to its partnerships with a diverse network of insurance carriers. Today’s borrowers expect a digital home-buying experience, and Matic gives them the digital insurance experience to match. For more information, visit https://matic.com/ or follow Matic on LinkedIn. Founded in 2007, RoundPoint is an agency and non-agency lender and servicer and a subservicer for commercial banks, credit unions, mortgage companies and hedge funds. The Charlotte, NC-based company currently services over $75 billion worth of mortgage assets, which are comprised of its own assets and loans subserviced for others. RoundPoint is licensed to service loans in all fifty states, the District of Columbia, and the U.S. Virgin Islands and is publicly rated by Fitch Ratings (RPS3+, RSS3+), Standard & Poor’s (Average) and Kroll Bond Rating Agency (BB). RoundPoint is a seller and servicer for Fannie Mae and Freddie Mac. It is an approved single family Issuer and servicer for Ginnie Mae, and maintains current MBS issuer eligibility. RoundPoint is also an approved servicer for the U.S. Department of Housing and Urban Development, the U.S. Department of Veterans Affairs and the U.S. Department of Agriculture. Lenders and investors can learn more about RoundPoint’s servicing offerings by visiting roundpointexchange.com. Borrowers may visit RoundPoint’s consumer website at https://www.rpmservicing.com.